North Arm Cove Residents Association has a long history of representing the Cove in decisions made in the community, in the council region and the state. Increasingly councils rely on associations for imput, and also councils and other bodies are making decisions without consultation so we need to keep our eye on issues that impact on our community and the environment. Our aim is to include residents in local planning and also capture and respresent the views, ideas and energy of the community. This is a good venue to meet residents in our village. If you are a resident and not yet a member, print off the membership application form and submit online or drop into the Treasurers letterbox and we hope to seen you at a meeting to verify your membership. Survey and naming of all reserves and water-access ways Our existing reserves and water-access ways are not clearly identifiable ONGOING. What is proposed? Objective: Liaise with Council to formalise the status and naming of all existing reserves in NAC; Investigate the provision of water access via existing drainage and access easements. Secure Public Land for Future Ownership The Cove has possibly the lowest level of public land of any urban area in Great Lakes region. We did request gazetting of site opposite Hall as Community Land ("Village green: Yallarwah"). Currently this is categorised Road Reserve and council do not feel it necessary to seek gazetting. Doug met with Lisa Schiff and Paul De Szell in August 2017 seeking future planning for boat ramps, increased water access and parks etc without success. ONGOING. What is proposed? Objective: Negotiate with Council and Developers to ensure adequate reserves and water access are included in any future re-subdivisions and, where appropriate, when land is transferred to Council under Section 570 of the Local Government Act. Boat Ramp NAC is a boating community without a safe all-weather launching facility for small vessels. Securing a public boat ramp for the Cove continues to be a key priority for NACRA. Council on 28062017 rejected any boat ramp within the village area. Council agreed by resolution to undertake an investigation of site north of village and possibly elsewhere but no action from council. ONGOING. - To be located within the greater village area on public recreational land. - To provide for a minimum of five launchings per day and for maximum off-road parking for five cars and trailers. - To be sheltered from excessive waves, currents and boat wash.
- To include provisions for a barbeque, tables and seats. - To provide low intensity safety lighting at night. - To specifically avoid the inclusion of flood lighting, toilets, water storage, fish cleaning tables, rubbish deposits and boat wash-down facilities. - Otherwise to be constructed in accordance with the NSW Public Works Department's Boat Launching Ramp Guidelines, 2015 edition. The Hall Committee put in swings set and slippery dip. Heros Bay Management Plan included a Natural Playground. The need for level open play area was highlighted in the most recent survey. Yallarwah provides open space suitable for ball-play, kite flying etc plus a bicycle/walking track and embryonic bmx track. ONGOING.What is proposed? A low-cost, low-profile, adventure-type play area is perhaps the most likely option to be achieved. Preferably associated with picnic and bbq facilities. Location(s) to be determined. 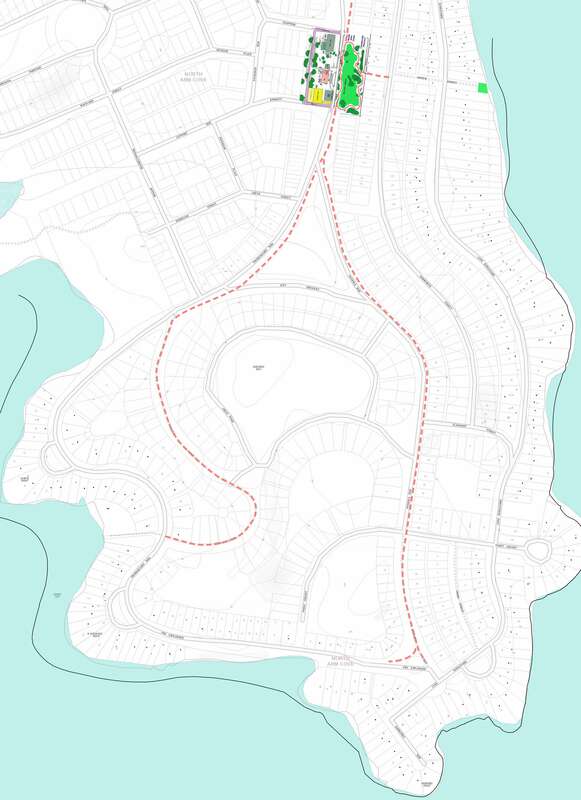 Casuarina Park water access, jetty Plan adopted by Council 22/2/2011. Note changes in the final recommendations. CBP + BBP grants. Dinghy Racks, Picnic settings COMPLETED. Small Dinghy Launching Ramp was expected completion 2014 extension to mid 2015 then completed 2017! No Jetty yet. Discussions occurred with Consultants (March 2016) but they failed to make written recommendations on Jetty. Their suggestion was for a centrally-located jetty which is what the final amended Management Plan proposed. Friends of Casuarina have been improving park. CBP Grant Application for a replacement for former BBQ unsuccessful 2016 and 2017. ONGOING. Water Street water access Plan adopted by Council 22/2/2011. Note changes in the final recommendations. Drainage work undertaken but needs to be redone. CBP + BBP grant. Dinghy Racks COMPLETED. Small Dinghy Launching Ramp was expected completion 2014 then sometime in 2016 - completed 2017. Problems with drainage easement funding in 2016-17 deferred to 2017-2018 - IN PROGRESS. Street signage NAC's street layout was not clear to visiting commercial and private vehicles. In particular, the two major cul-de-sacs of Cove Boulevard and Promontory Way/The Esplanade caused confusion and unnecessary manoeuvring and traffic movement. Map installed at site determined by Council. Association installed an advisory sign to alert visitors to its existence. Additional signs requested. Only some supplied after reaching impasse with Council. What is proposed? Objective: To work towards clear and simple street signage at key sites in the village. Public Jetty NAC is a tide restricted community without provision for the safe landing of passengers from small vessels or for the evacuation by water of the able bodied and the disabled in an emergency. Discussions with Consultants (March 2016) but not supported in final report. ONGOING. - To enable pedestrian only access to 1 metre draft vessels at MLWS (Mean Low Water Springs) without dredging. - Although vehicle access to the jetty site would be desirable, this is not considered an essential requirement for a successful project. - To provide low level landing access for tenders and small vessels. - To provide short term berthing for two vessels up to 5.2m in length. - To specifically avoid the inclusion of flood lighting, toilets, water storage, fish cleaning tables and rubbish deposits. - Otherwise to be constructed in accordance with the NSW Public Works Department's Design Guidelines for Wharves and Jetties, August 1990 edition. Heros reserve master plan Council resolved in March 2012 to develop a plan for Heros Bay Reserve. Master Plan for Heros now Plan adopted by Council, Costings Work now required includes replacement of picnic facilities, covered gas bbq, dinghy/kayak racks, playground facilities. What is involved? Heros Bay is the best available waterfront reserve for public recreation. The Heros master plan now provides direction and continuity for the planning, management and maintenance of this important public open space. Community Precinct Council resolved in November 2008 to develop, in conjunction with the community, a master plan for the Hall site. A sub committee was formed in 2015 to attempt to expedite Hall site plan. Including proposed village green opposite. Submitted our plan to Council in December 2015. Included in Give us a heart project. Exercise facilities, BMX track, planting still to come, ONGOING. Light up our heart project grant successful and essentially complete. A "trail layout" with multiple pieces or groups of equipment spread at intervals around the circuit. The biggest capital cost will probably be the signs at each spot to describe the exercises involved! The actual static "equipment" that would be required is fairly basic and could be locally constructed. The proposal has had a letter of Council support for a grant application. And some of the exercises that would be covered on the signs require no equipment at all! An exercise that involves standing on one leg (then the other) with your eyes shut and seeing if you can count to twenty. The provided "equipment" along the lines of the above would run (in sequence) parallel to the main path. Highway bus shelter Bus Companies which stop at Karuah or the Rock are willing to pick up passengers by arrangement on the highway near the Cove. Currently there is no designated location or shelter. ONGOING. What is proposed? Objective: Negotiate with Council and RMS regarding siting of a bus stop and the provision of shelter and safe parking area. Road drainage and widening Throughout the Cove drainage is largely inadequate, roads are deteriorating and road width is generally inadequate to allow vehicles to pass safely without moving off the sealed surface. Currently many of these issues are not even on the Council's 15 year plan. ONGOING. Work on several stages of the new Stormwater drainage plan now completed but some major works yet to be undertaken. Includes sealing of Merriwa west. There is now a small allowance for drainage in Council's forward plans for Capital Works. ONGOING. What is proposed? Objective: Keep Council aware of the pressing need for improvements to Cove roads and drainage. Walking tracks, fitness trail Walking is a very popular activity in the Cove. ONGOING. What is proposed? Objective: Establish walking tracks that if possible link our major public reserves with the provision of basic exercise stations on public land. The walking/bicycle on the Village Green to be the hub of a walkway network utilisng The Ridgeway as a backbone.